Triisobutyl Phosphate production process - ZhangJia Gang YaRui Chemical Co., Ltd. The first step: the esterification reaction ratio is three: phosphorus oxychloride, isobutanol = 1 ∶ 5 ～ 1 ∶ 9; the catalyst is added to account for the total 5 ~ isobutanol mixed isobutanol 15%, then with ISO butanol remaining together into a reaction kettle, or the catalyst is added to three phosphorus oxychloride in the stirring, cooling condition, dropping three phosphorus oxychloride, maintaining the reaction temperature is between 15 ~ 60 ℃, dropping three phosphorus oxychloride time is 1 ~ 6 hours, dropping the end, continue stirring deepen reaction for 0.5 to 4 hours, and maintain the temperature not lower than 5 DEG c.. The second step: removal of alcohol to acid: under reduced pressure, the reaction after the end of the materials are heated evaporation, produce isobutanol and removed by reaction did not participate in the reaction of by-product hydrogen chloride, and not the highest alcohol end temperature beyond isobutanol boiling point is 10 ℃; alcohol removal vacuum maintained at above - 0.06Mpa, alcohol time is 1 ~ 8 hours. The third step: the neutralization and water washing: under stirring, to the removal of alcohol material after adding alkaline material neutralizing the removal of hydrogen chloride residues in the material, with pH value of 6 ~ 8 for neutralizing the end; then add 30 ~ 100 ℃ hot water wash, add water amount of mass or volume of 0.5 ~ 1.5 times static, removing water layer, get three initial product Triisobutyl Phosphate. The fourth step: distillation: first detection of Triisobutyl Phosphate product pH value is in 6.5 ~ 7.5 between, if not meet the requirements, with alkaline substances, adjusting the pH value to 6.5 ~ 7.5, and then distilled under reduced pressure, to remove the low boiling component, collected Triisobutyl Phosphate products. 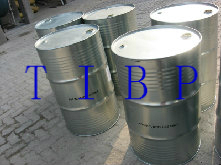 The above is the production process to explain the situation, such as the Triisobutyl Phosphate production process to further understand please contact us. If Triisobutyl Phosphate production process product is not what you want, we can be customized according to your needs, please send us your order to Email: sales@yaruichem.com , or click here to post your buying lead.